Purpose: Following health-care organisations, many mental health-care organisations nowadays consider starting to work with self-managing teams as their organisation structure. Although the concept could be effective, the way of implementing self-managing teams in an organisation is crucial to achieve sustainable results. 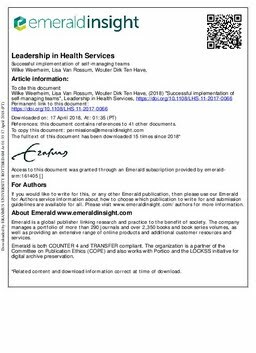 Therefore, this paper aims to examine how working with self-managing teams can be implemented successfully in the mental health-care sector where various factors for the successful implementation are distinguished. Design/methodology/approach: This qualitative case study is executed by analysing 18 interviews within two self-managing teams in a mental health-care organisation located in the Netherlands. A coding process is executed in two steps. The first step is open coding, to make small summarising notes within each interview section. The second step is refocused coding, where the open codes were collected, categorised and summarised by searching for recurrence and significance. The coding process is made visible within a code tree. This code tree formed the basis for writing the findings. Findings: Success factors for the implementation of a self-managing team that resulted from this research are a clear task portfolio division, good relationships within the team and a coaching trajectory with attention for a possible negative past. Originality/value: By having used a specific change management model, the Change Competence Model, it can be concluded that a high change capacity will positively influence the success of a self-managing team in the context of a mental health-care organisation.